Ah, the summer fling. I was never very good at short-term romances; I always got too attached. Still, late August seems like the right time to test out a few scented frivolities on a whim. I can love them and leave them, or if I feel a lasting chemistry, I can purchase a full-size bottle for fall. 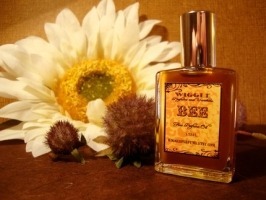 Wiggle Perfume has been one of my recent flirtations. I recently went through a set of samples from this indie perfumer based in Olympia, Washington, and several blends caught my fancy. Black Bonni (below left) is "a blend of absinthe, talcum powder, lily of the valley, violet, and luminous white musk" that cultivates a naughty-Victorian mood. It's a charming oddball that I wanted to try more than once. It has a piercing, minty-green opening, followed by a violet heart that seems to vary from dewy to dusty in different wearings. It dries down into a light skin scent, thanks to the white musk note. Black Bonni reminds me somewhat of Jean-Charles Brosseau's Fleurs d'Ombre Violette-Menthe. I haven't smelled Violette-Menthe in a while, but I remember it as having that same quirky (but appealing) juxtaposition of sharpness and softness. Wiggle Perfume sells its oils in two sizes, and each scent is stylishly labeled with its own color scheme and typeface. The Wiggle site presents its merchandise in cleverly photographed displays, in order to give an idea of each fragrance's "personality," and these visuals are hard to resist. Fortunately, Wiggle offers such an array of blends at such a reasonable price point that this can be a fling you won't later regret. 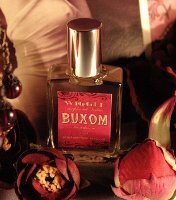 Bee, Black Bonni, and Buxom perfume oils are sold through Wiggle Perfume's Etsy shop, in 5 ml ($11) and 10 ml ($30) sizes. Individual samples are also available ($1.50 each). Cute packaging, and Bee sounds nice. Mals86, I’m really fond of my Bee sample. It’s hard to find a good honey single-note fragrance. Black Phoenix’s “O” is too musky, and L’Occitane’s Honey Water (discontinued, anyway) was very light! the packaging reminds me of sweet anthem. these sound great. may have to try one soon…. Gelatin, I haven’t browsed the SA site in a while… thanks for the reminder. I like the notes on Black Bonni. Any ideas what the name means? I’m at loss here.. Apparently it’s the name of a new-burlesque performer who is a friend of the Wiggle creator! Thank you! I googled but got nothing. I’ll see if I can get to try them. These sound good and I’m particularly interested in Bee. Thanks for the review, Jessica, I will be checking out their Etsy shop! Hi, Jill. Have fun browsing! I’ve been very curious about this line. Thank you for the reviews. Dang, I got so curious I went and ordered some samples. Whoops. Hope you’ll enjoy them! Never heard of this range before, but then that’s what the likes of NST is for! I’m not a big fan of perfumed oils, but Bee sounds nice. Lovethescents, I enjoy having a reason to try new things all the time. It’s all in the name of NST research. 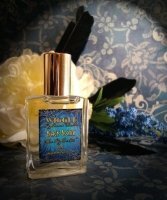 Wiggle Perfume is on of my favorites and I’m happy to see her get reviewed! I have around 20 of her scents in the small roll-on bottles. My top picks are Penelope, Little Five, Duncan, Liberty, Guajira, and Carmilla. Sweet powdery incense with a bit of smoke. Bee, maybe the Honeysuckle Sweet Tea would appeal to you! it’s a bit less sweet. Thanks so much for the reviews. The line sounds intriguing. I’ve been on the hunt for a good honey scent, so this was very timely for me. Bee sounds as if it might be right up my street. Thanks, Annunziata — I haven’t owned a honey scent in a while, but I’ve really been enjoying this one. Great review! My first foray into fragrances was on etsy with sweet anthem and scents by the sea. I’ve always browsed the wiggle page, now I’m off to order sone samples! Does she do an oakmoss? Or a smoky pipe scent? Thanx for a fun review! Hi, Elise! Annabelle lists oakmoss as a note, although it felt more red-musky to me. In the men’s scents, Remedy has oakmoss and Liberty has pipe smoke! Oh, dear, I think I might have to order samples of Bee and Honeysuckle Sweet Tea! Darn you, er, I mean, thank you for bringing this linetot my attention! Sorry, er, glad to oblige! I caved and got the little bottles, since Bee was on sale – and added Puanani (also on sale) since I am a tropicals whore, er, enthusiast. I’ve never heard of this line, but they sound very interesting. Thanks Jessica – you’ve earned a stone for your enabler’s pin! Thank you, Rappleyea! I can just picture that enabler’s pin. It will have a prominent place on my Scent-Obsessive uniform. Just like Girl Scouts! I’ve spent some time trolling through the perfume offerings at Etsy, and even with the great prices, I’d been hesitant: too many to sort through.